Ever since the sign for Eastside Social (@Eastside_Social) went up in the Leslieville space which used to house the Upper Crust, I was eagerly awaiting its opening. When I called to make a reservation for a Wednesday evening, I was told that we could only make one if we were dining early (before 6) or late (I can’t remember if this was 8:30 or 9). The hostess said that they had been so busy since they opened that they leave prime hours open for walk-ins only. That’s always a good sign! Upon entering the restaurant, you’ll find that the space is divided into two separate areas – a bar and dining room. I love the décor which emulates a Maritime theme. 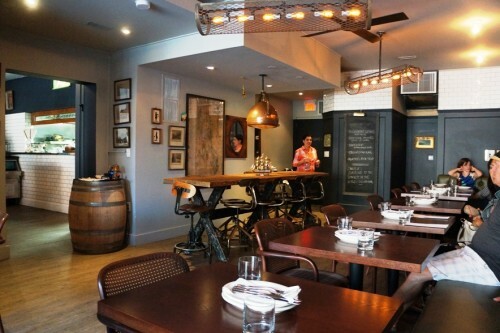 I’d expect nothing but a great space as the restaurant is owned by interior designer Cherie Stinson (from the Food Network’s Restaurant Makeover) and Joey Skeir. The pair, who are from the Maritimes, were previous co-owners of the nearby Ruby Watchco, so they have some restaurant experience. In the kitchen, you’ll find Chef Chris Mentier (previously of Ceili Cottage) and Chef Stefan Skeene (previously of Ruby Watchco). 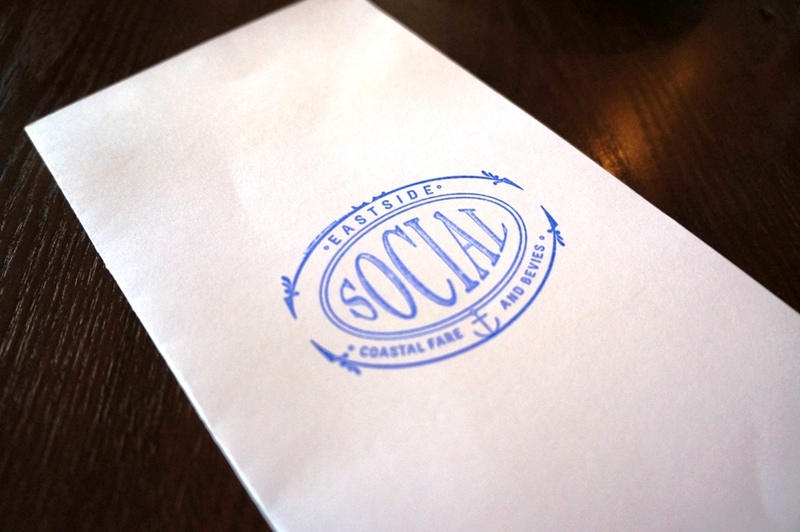 According to their website, Eastside Social serves “coastal fare & bevies.” So, expect to find an extensive menu of comfort food that’s designed for sharing. As far as cocktail bevies go, they offer a small selection of them, most of which are priced at $11. The four of us decided to share the Punch Bowl – vodka, port, rum, grapefruit juice, chamomile syrup, citrus sugar, nutmeg ($21 for two; $35 for four). I loved the cute little punch glasses and the antique-y canister it arrived in. 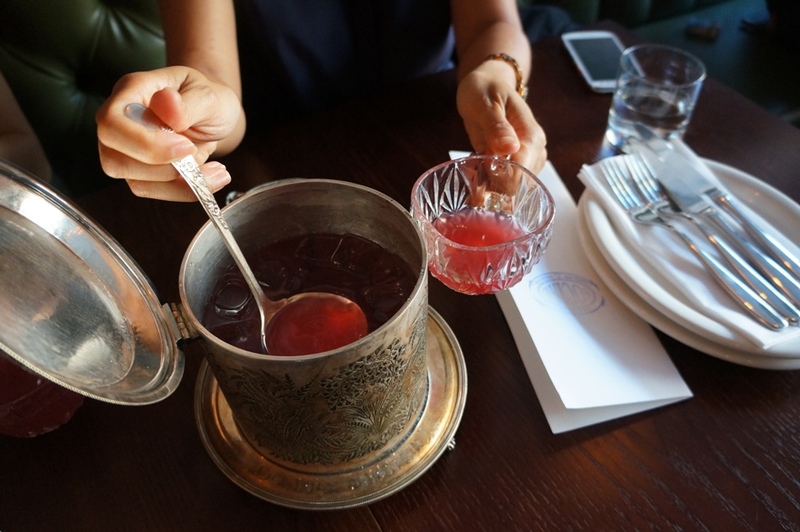 The punch was really, really delicious… dangerously delicious, if you ask me! 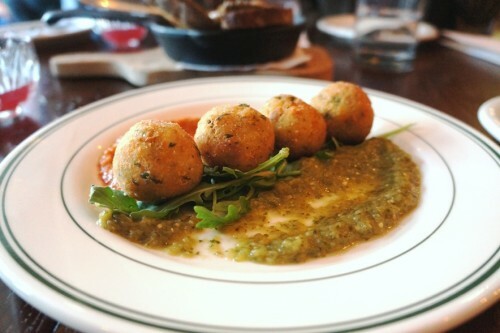 To start, we shared the Salt Cod Balls – fried with green salsa & chipotle romesco ($12). One order came with four bite-sized balls which were well fried. As one would expect, they were certainly on the salty side. Not really my cup of tea. The one part of the dish I loved was the green salsa. If only I had some bread to soak up every bit of that tasty sauce. Up next was the Mushrooms on Toast – mushroom pate, sautéed mushrooms, brandy butter ($11). 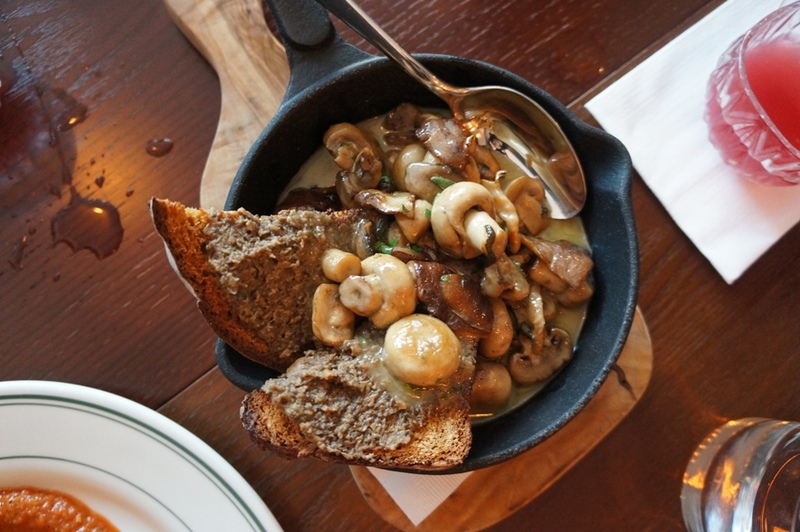 Overall, it was a solid mushroom dish but not particularly memorable. To be honest, when writing this post I even forgot we had even eaten this. Like I said, not particularly memorable. One menu item that caught everyone’s eye was the Yorkshire Pudding Poutine ($13). 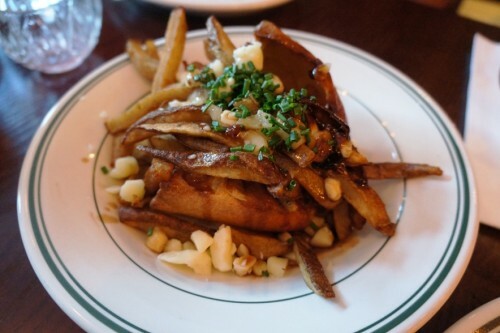 The fries were nice and crispy but the poutine could’ve used a bit more gravy to melt the squeaky cheese curds. But then again, maybe it didn’t need more gravy because we found it incredibly salty. At first we thought the saltiness was coming from the gravy but the Yorkshire pudding itself was also insanely salty. 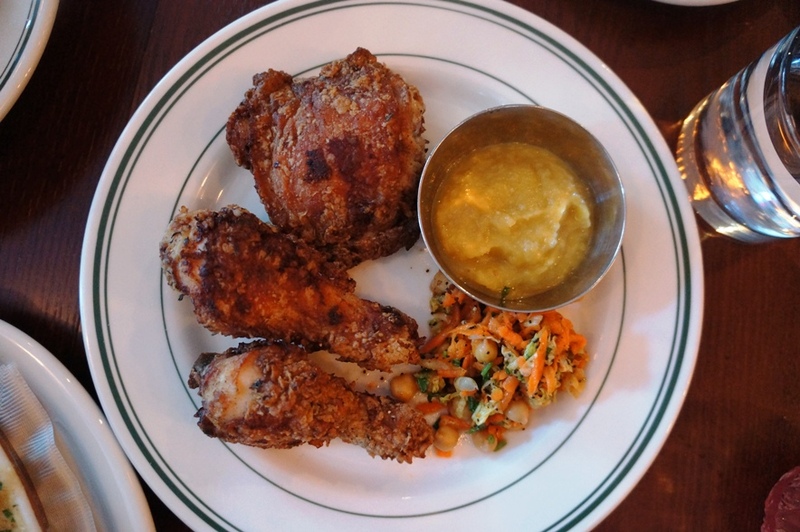 Speaking of salty, the Fried Chicken – breaded legs and thighs, chick pea slaw & hot sauce ($14) was also quite heavy on the salt. It’s too bad they were so heavy-handed with the salt because aside from that, I really enjoyed the fried chicken. It had a nice crisp batter and was wonderfully moist and juicy. The last dish we shared was the Homemade Hamburger Helper – daily meat, noodles and cheese ($13). It was also a little salty (but maybe it was just the residual salt sitting in our mouths from the other dishes). 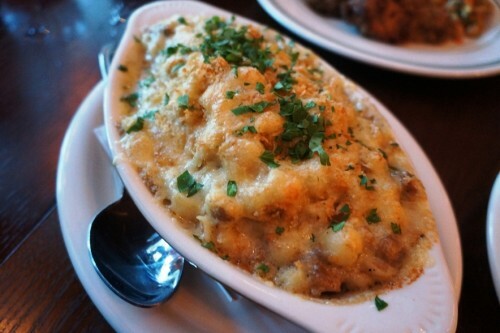 Nevertheless, this was my favourite dish of the meal – creamy, cheesy deliciousness! It reminded me of a mac & cheese dish with some ground meat thrown into it. I never ate Hamburger Helper growing up but if it’s always this good, I was definitely missing out on something during my childhood. 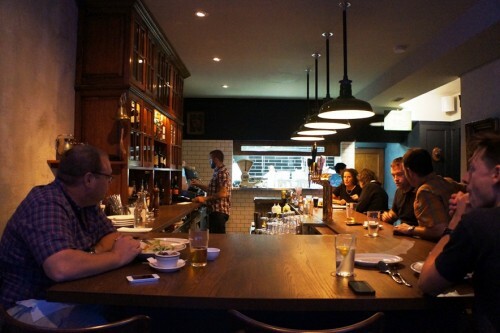 Given all the great things people have been saying about Eastside Social and how packed they’ve been, I feel like we dropped by on an off night. While the Hamburger Helper was a memorable dish, the other dishes were memorable for the wrong reasons – way too heavy handed with the salt.